Please tell me there is a way to make the grid 1 inch = 1 foot. And an easy way to get measurements of different parts/items of plan. 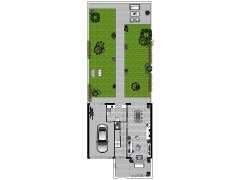 is floorplanner the only floorplan website that has elevation ? The wood stove is not rendering in 3D. I believe this is a bug? There are no option to start new or a build menu. I cannot even start to draw a plan. the floor menu arrow don’t work either. There is nothing to us nor a menue to choose from. Accidentalmente borre el diseño que tenía para la Planta Baja del plano que estoy armando. Cómo puedo recuperarlo?